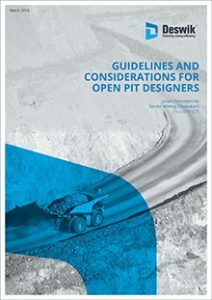 It is recognised that some of the course participants on the Deswik software “Design for Open Pit Metals” course may be new to pit design and may need some advice on how to undertake a pit design. This article has been written with that requirement in mind, and has been written specifically for assistance with the aspect of computer aided pit design – i.e. geometric design guidelines. It is not intended to be all encompassing on general pit design and operating principles. Remember, the software assists the design process not the design itself. The design is controlled by the engineer doing the design. Your company may have a haul road/pit design manual – use it if it exists. For those that do not have a design manual, or only have limited guidelines, then this article may help you in the process of designing your first pit. To provide the guidance for the excavation of the pit to be detailed and laid out by the short-term design engineers. Cost Minimization / Value Maximization (less waste, more ore). Expect the process to be iterative – the design may need several attempts to come up with a satisfactory final design. Design may need to be done bottom-up, top-down, or a combination of both. It’s a skill to juggle many competing factors and come up with good designs. You will get faster and develop better designs with practice and experience. Familiarity with process and an operation will improve your ability to design quickly. On the topic of safety: A good design can contribute to the safety of an operation. A poor design may add unnecessary safety risks. When diverting from standard good practice design principles (e.g. a dual carriage way running width of 3.5 times truck width) – be prepared to defend your design criteria in a warden’s court in the event of an accident or even a fatality in the pit. Documenting your design principles and reasoning will help you and future pit designers. Additionally, make running notes during design steps (which will help final documentation, and capture steps that worked and did not work).